Posted in Feature Film Reviews | Comments Off on Daddy’s Home – Nobody does Step-Parenting like Ferrell and Wahlberg! Thomas Edison’s Secret Lab is an all new animated comedy series from Genius International starring the greatest inventor of all time and a madcap cast of characters that allows kids to experience how fun science can be. Unknown to the world, Thomas Edison had a secret lab where he invented a virtual version of himself and a nearly completed robot to guide and inspire future generation of young scientists. The secret lab, Edison’s virtual alter ego, and his prototype robot remained hidden until a 12-year-old prodigy cracked the secret coded message that Edison left behind. This young genius named Angie and her science club friends move into the lab and the fun begins. Each episode covers fun scientific topics from dinosaur fossils to minerals to gravity and so much more! KIDS FIRST! Film Critic Benjamin P. comments, “Thomas Edison’s Secret Lab: Secret Lab Meeting is a fun, educational adventure that had me humming songs about science for days. I like this show because it makes science a lot more fun. 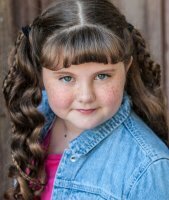 It’s a series about four kids who solve problems using all kinds of science.” Abigail Zoe L. adds, “I just love this animated series. I found myself smiling, giggling and bouncing in my seat. I actually never left the couch because science is my favorite school subject and I didn’t want to miss a thing!” See their full reviews below. Thomas Edison’s Secret Lab: Secret Lab Meeting is a fun, educational adventure that had me humming songs about science for days. I like this show because it makes science a lot more fun. It’s a series about four kids who solve problems using all kinds of science. One of my favorite parts of the show is the relationship between the characters. I like that they would nearly do anything to keep each other safe throughout the show. 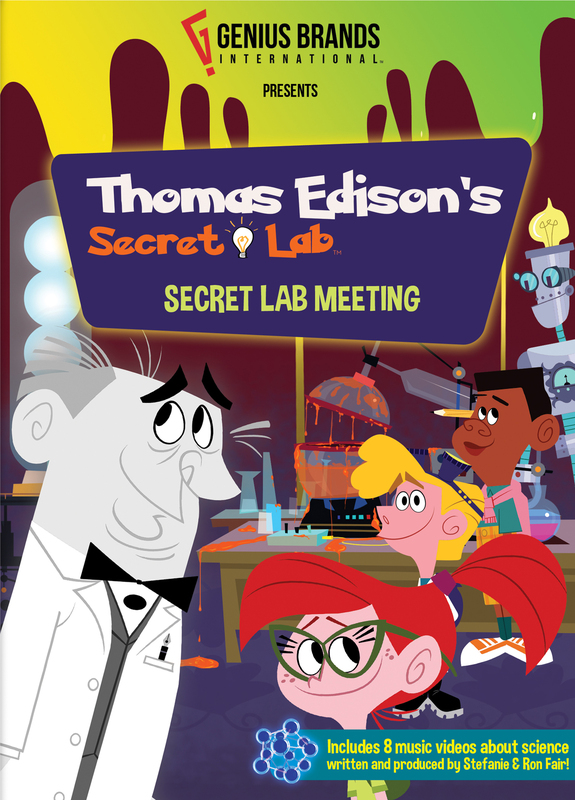 Secret Lab Meeting is a collection of different episodes from the television series that teaches children cool stuff. The main characters are the kids in the lab, Kent, Angie, JD, and Nicky. With the help of their hologram of Thomas Edison and their robot Von Bolt they can solve nearly anything, from a zombie virus to a slime monster and even stinky teenagers. My favorite character is Thomas Edison because he is very smart and he is always willing to help the kids. He’s wise and stays calm during a crisis. My favorite episode is If The Fossil Fits because it’s about dinosaurs and dinosaurs are really cool and studying them can teach you a lot about archeology. My least favorite episode is Dunkin Zombies. It’s the first episode in the collection but there is no introduction to the characters and I had trouble figuring out the characters and the story line for a while. I like the second episode No Volts For Von Bolt because of how they explain the elements by introducing a fake police department that specializes in cases involving elements from the periodic table. It’s a great genre flip from the modern-day setting to the feeling of an old school detective show. In the third episode, we see the crew from the lab use the virtual reality room to travel back in time and meet someone who contributed to science. A cartoon Louis Pasteur makes a cameo appearance to teach the kids how to melt slime to destroy a monster. I like the balance between the history and the action scenes. The history in this show is really cool and educational. The people the kids meet when they travel back in time have accomplished very interesting feats to help science and its progress. One example is Jonas Salk who created the vaccine for polio. Each episode has a different topic from chemistry to agriculture and even cloning. At the end of each episode, there is a fun little song recapping all the major vocabulary from the episode. I recommend this series for ages 7 to 11. Younger kids might not understand the more complicated science lessons. I give Thomas Edison’s Secret Lab 3 out of 5 stars. I just love this animated series. I found myself smiling, giggling and bouncing in my seat. I actually never left the couch because science is my favorite school subject and I didn’t want to miss a thing! I really like all eight fun-filled episodes that are about solving interesting scientific problems. I like the different animated characters, story line and upbeat music that make science come to life! I also absolutely love that we meet many very important scientists like Thomas Edison, Louis Pasteur and others that help the world be a better place. Guided by a virtual Thomas Edison, each episode is packed with fascinating scientific information and vocabulary that entertain and inspire the young scientist in each of us! The Lab Team Angie, JD, Kent and Nicky jump into virtual worlds in each episode through a machine called, ALVA where they seek the advice of many important and famous scientists to solve scientific problems. The robot Von Bolt is a nice addition to the team and funny as he tries to attract a girl robot in one of the episodes. At the end of each episode a robot group, the Von Bytes, perform happy, upbeat, catchy, fun songs with pop up scientific vocabulary words used in that episode. Elements, enzymes, fossils, fertilizers, cloning, animal behavior and even body odor are just some of the fun scientific topics we learn about in this animated series. While there are many super fun episodes, my favorite is Dunkin’ Zombies because the character JD turns into a funny green donut craving zombie after he gets infected by a virus. There are several hilarious scenes in this episode alone like zombies not liking gluten-free donuts and craving donuts instead of brains. By the end of this episode we learn how viruses spread and also how they can be cured by a vaccine. Through challenge and perseverance the lab friends with the help of Thomas Edison and Louis Pasteur defeat the virus. The only downside to this series are first, some viewers may find the animation kind of square and simple when compared to other more sophisticated animated shows. 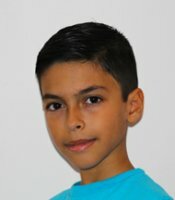 The other downside is that it would be better for the kid voice-over roles to be actual kids so that young viewers can better connect to the kid characters. At the same time, the kid characters are quirky and you can’t help but love them. This film teaches viewers that science is not only important but fun. All the different episodes spark the imagination and, if you are not someone who likes science, you may just be by the end of this series, or at least you will have a better understanding of the world of science. Thomas Edison’s Secret Lab: Secret Lab Meeting is a great educational series and an entertaining way to introduce kids to many different scientific topics. I give this film 5 out of 5 stars and recommend it for ages 5 to 10. The wait is over! Star Wars: The Force Awakens opens this weekend and, the word is that you will NOT be disappointed! KIDS FIRST! Film Critic Gerry O. comments, “People have been waiting for a good Star Wars story ever since Episode VI came out 32 years ago. Fellow Star Wars fans, I am pleased to tell you, it has come.” The secrecy surrounding this release has been extraordinary. Even our KIDS FIRST! Film Critics who were scheduled to attend press screenings had to pledge to secrecy the time and location and weren’t allowed to even tell anyone they were going to it. You should know that the pace of this film is very fast and the action, quite intense. The original film’s iconic characters played by Harrison Ford, Mark Hamill and Carrie Fisher, are back, older and even more incredible than ever. But, the new team, played by Daisy Ridley and John Boyega, definitely strike out on their own and command attention. The film is long at 135 minutes but then, so were the first ones – Episode IV (121 minutes); Episode VI (131 min. ); Episode I (136 min.). Nathaniel B. (KIDS FIRST! 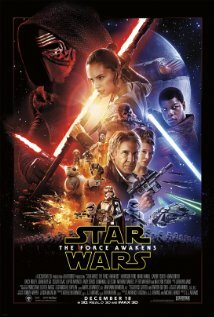 Film Critic) adds, “Star Wars: The Force Awakens is a wonderful film that many people will love. Today’s technology really makes the fantasy of Star Wars seem like reality.” See our youth reporters’ full reviews below. It is surprising that only 10 to 12 hours of films created the giant franchise we know as Star Wars. People have been waiting for a good Star Wars story ever since Episode 6 came out 32 years ago. Fellow Star Wars fans, I am pleased to tell you, it has come. Everyone knows Star Wars is a sci-fi, action franchise, but this film is very unique for the fact that it goes much deeper. With Evil getting more and more powerful, there is drama and fighting between the characters, but that doesn’t stop romance from sneaking in with a little bit of comedy. Granted, I was worried it would turn into a kid’s comedy, but quite a few times I found my self thinking that not only are the jokes perfect, they are also not over used! Alright, let’s get to the part everyone wants to read, the plot of the most hyped, but hidden film of the decade. The events start out 20 years after what took place in Episode 6, (spoiler alert for people who didn’t see episode 6). The Empire has fallen, yes, but a new Evil has risen, known as The First Order. The rebellion needs new Jedi now more than ever, but Luke (Mark Hamill) is missing and they need to find (wait for it) a new hope! Is the film worth the wait? Ever since almost a year ago, people have been talking about new Star Wars episode, and it is SO worth it. Famous directors have taken on some great challenges before, including Spielberg finishing Kubrick’s AI. But J.J. Abrams took on something completely out of the ball field trying to continue Star Wars. The cinematography is spectacular, the ending shot (no spoiler) is one of the greatest endings I have ever seen in a film, and the whole story itself is unexpected and very enjoyable. Although there are many aspects that are not in the original Star Wars films, I think it is actually very nice to see Star Wars not get ruined, but go through its own evolving evolution. As for the acting, of course, the original A-Team – Mark Hamill, Harrison Ford, Carrie Fisher and more – are phenomenal and I think it was the perfect idea to bring these characters back for the pure enjoyment of long standing fans. However, it is really Daisy Ridley who steals the show. Her character, Rey, is so fresh and unique, full of emotion, and this character (still no spoilers, sorry) goes through so much drama in the film. It must have been a very hard role to play. Daisy gives it 110%. I predict she will be win an Oscar nomination for this role. The special effects obviously got better since the last Star Wars film in the early 2000s, and I still want to mention how breathtaking they are. Even for 2015, with all the CGI aliens, ships and spectacular space scenes, it is quite literally “eye candy.” My only criticism of the film is that it is a bit too long. However, not one single scene is out of place or feels unneeded. One of my favorite scenes is when we are reunited with Hollywood’s favorite space ship. Rey and Finn (John Boyega) are trying to escape The First Order. They have two options for space flight, a “piece of junk” or another space ship. Well, the space ship gets blown up and it turns out the “piece of junk” is the millennium falcon! Of course, everyone cheers, claps and whistles in the audience once the camera shows the breathtaking ship. It is not only enjoyable, and a bit funny, but the camera technique is perfect. If you want to know the rest of the story, go get your tickets and watch the film! This film is actually pretty mature. It isn’t as kind as episodes 1, 2 and 3. It has its violence, so I recommend it for ages ten to eighteen. And, adults who saw previous Star Wars films and appreciate them will enjoy this film as well. I give it five out of five stars, because, even if it is a little bit boring in the middle, (it is 2 hours and 10 minutes long) J.J. Abrams, the cast and crew achieved the impossible and created a new masterpiece that can be proudly added to the Star Wars franchise. I am also glad to say that, for the first time in over 20 years, Star Wars returns! You can see Star Wars: The Force Awakens in theaters starting December 18th! Star Wars: The Force Awakens is a wonderful film that many people will love. Today’s technology really makes the fantasy of Star Wars seem like reality. The scenery is great from the beginning to the end. The forests are vast and really fit the movie wonderfully. The beautiful stars, planets and, even the spaceships, are amazingly real looking. The storyline It tells what happens after peace was established in the galaxy at the end of Episode 6, but now it’s more than 30 years later and there is no longer peace. The actors lured me into believing everything is really happening. Daisy Ridley as Rey shows emotion and strength. John Boyega portrays Finn as a man who starts out being afraid but must overcome his fears. And Adam Driver is excellent playing Kylo Ren, the new bad guy who tries to live up to the evil of Darth Vader and does many foolish things in the process. Each characters enliven the new story. Also, Star Wars fans of all ages will love reconnecting with characters from the original films. The costumes are great and fit the characters in many ways. Rey’s costume, a rugged suit for the desert planet Jakku, shows that she is resourceful and can take care of herself. The unusual and cool costumes fit in well with the previous films in the series. Many strange creatures add the element of being on other worlds. I really enjoyed seeing all the extra characters in each scene like pirates, gangs and a variety of aliens. A fun new sidekick is BB-8, a feisty round astromech droid that belongs to the rebellion. The buildings look real and at the same time like they belong in Star Wars. The props, such as blasters and space ships, are also realistic. They are grungy and look like they have seen some use. The only things I didn’t like were the Stormtrooper’s blasters and armor which looked plastic and fake. The special effects are wonderful from lightsabers to explosions and lasers from the guns. They are a huge part in the film and bring the movie to life. I do love this film but some parts of it are not quite the way I expected. There are not many breaks from battles and there’s so much action that it feels intense and rushed. Posted in Feature Film Reviews | Comments Off on Star Wars Returns! For The First Time In Over 20 Years! Mike the Knight is a Canadian/British animated TV series created by Alexander Bar and Written by Marc Seal. It airs on Nick Jr in the US. Mike is a young boy living in medieval times who has a bright future. The son of the king and queen of Glendragon, Mike is determined to follow in his father’s footsteps and become a noble knight. The young knight-in-training is given missions to complete, which he attempts to do with the help of his two dragon friends, Sparkie and Squirt; his sister, witch-in-training Evie; and his horse, Galahad. Mike tries to be the bravest knight of all. With the help of his friends and his rallying cry, “be a knight, do it right,” Mike discovers the power of responsibility and learns to do things the right way. KIDS FIRST! Film Critic Ryan R. comments, “I like that Mike is very brave and confident. 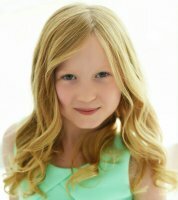 This program shows kids how to be confident in themselves and encourages them to believe you can do anything when you put your mind to it.” Morgan B. adds, “At first I thought the film was just for little boys but after watching it, I think that little girls will love it too.” See their full reviews below. I like that Mike is very brave and confident. This program shows kids how to be confident in themselves and encourages them to believe you can do anything when you put your mind to it. I like how Mike doesn’t cheat and always plays fair. That is a great lesson that Mike shows you throughout the film. Meet Mike, voiced by Trek Buccino, a knight in training who dreams of being a brave knight like his father when he grows up. His father, the King, is a knight who is away exploring other lands. Looking up to his father, Mike wants to learn to become a knight too. However, he is still in training. With his two dragon friends, Sparkie and Squirt, his sister, Evie, who is a witch-in-training and his horse, Galahad, Mike tries to be the bravest knight of all. When his mom and dad think he’s prepared, they put him on a quest to solve the “Knight’s Puzzle” to see if he is ready to be a knight. Mike goes along on this journey with his friend, Richard to complete his mission. Can Mike complete the quest? My favorite characters are Mike and Evie. Evie is one of my favorites because, unfortunately for her, her magic always goes wrong and it leads to disastrous but hilarious effects. Even though her spells go wrong she keeps persisting and never gives up. Mike is another one of my favorites because he also never gives up on the idea of becoming a knight. You see his persistence throughout the entire film which is a great message for kids to see – If you want to accomplish something, never give up and keep trying. What I didn’t like about this show is that it has very little humor. Also, this show wasn’t very entertaining for me as an 11-year-old. But, keep in mind that this movie is perfect for little kids. I recommend it for ages 5 to 8 and give it 4 out of 5 stars. I also recommend it to people who like action, adventure, family and kids films. The DVD has some trailers of other Mike the Knight DVDs and The Doozers DVD. It also offers bonus features where you can meet the characters or do karaoke to the theme song. That’s sort of fun! Knights, wizards, kings, dragons and more will put a smile on your face! The planes make me want to jump in and take a ride. The animation is colorful and has great details. The many action adventure scenes are spot on and flawless. The animation is so detailed that it is just mind-blowing. At first I thought the film was just for little boys but after watching it, I think that little girls will love it too. The animals and the girl wizard will definitely be some kids’ favorites. The wizard is cute and, since she is still learning, this leads to many mistakes and funny moments. The story line includes a treasure hunt and a mystery which will capture your attention. The two story lines flow together into a fun, family-friendly, animation adventure. The movie has great relationships between father and son. You can see all the similar qualities they share, both good and bad. The voice actors are quite wonderful and the emotions between the characters really come across. The characters show what true friends really do for each other. The characters are adorable and the voice over work matches well with the individual characters. They are all cute and quirky. My favorites are the dragons which are surprisingly kind, not your usual breed of fire breathing beasts that want to eat or barbeque you. The villains have a beast of their own which terrifies them. I really wanted to like them because they are funny and made me laugh. However, they are not nice and think that everything is theirs. Mike the Knight: Mikes Bravest Mission teaches us to never give up. If you try and fail maybe you should look at the problem another way and try something different. No matter what, you should always keep trying and eventually it will all work out. This new DVD by N Circle Entertainment is perfect for kids ages 4 to 18.The colorful movie will keep little ones entertained and older kids will love the story line. I give this movie 4.5 out of 5 Dragons. This film is told from Igor’s perspective. We see the troubled young assistant’s dark origins, his redemptive friendship with the young medical student Viktor Von Frankenstein, and become eyewitnesses to the emergence of how Frankenstein became the man – and the legend – we know today. KIDS FIRST! Film Critic Lainey A. commented, “This phenomenal live action feature film, directed by Paul McGuigan, is jaw-dropping! I love this movie because it is an entertaining, action-packed bromance!” See her full review below. This phenomenal live action feature film, directed by Paul McGuigan, is jaw-dropping! I love this movie because it is an entertaining, action-packed bromance! I know you’ve all probably heard of the typical Frankenstein story where a mad scientist creates a monster. Instead of focusing only on Frankenstein and his ghastly creation, this rendition tells the story from the vantage of Doctor Frankenstein’s sidekick, Igor Strausman (Daniel Radcliffe). Set in London in the early 1900’s, a hunchbacked clown is destined to live his life nameless and mistreated as a circus freak of nature. The clown is hopelessly in love with Lorelei, the beautiful and kindhearted trapeze artist played by Jessica Brown Findlay. After her horrific fall, the clown uses his extraordinary knowledge of the human body to save Loralie’s life. Victor Frankenstein, a gifted surgeon (James McAvoy), notices his medical expertise and rescues him from the abusive circus. The clown is later given the name of Igor Strausman. Frankenstein helps correct Igor’s posture though a very painful and sinister process. Later, the two become extraordinary friends and partners, combining their scientific knowledge and medical expertise to create life out of something that is already dead. A major subplot involves Roderick Turpin (Andrew Scott), a Scotland Yard investigator who religiously opposes Doctor Frankenstein’s work. He is willing to do anything in his power to stop Frankenstein from going against what he believes is God’s will. My favorite scene is when Dr. Frankenstein and Igor are trying to fight off the monster they have miraculously created. This scene involves crazy special effects and will truly leave you hanging on the edge of your seat. My favorite character, by far, is Igor. Daniel Radcliffe plays him as very loving and compassionate. He finds and loses himself in the complexities of his relationship with Victor. Lorelei helps to keep Igor grounded and is there to guide him. I give Victor Frankenstein 5 out of 5 stars because it is not only unpredictable but also has impressive performances by the main characters. This science fiction drama is one of my favorite film versions regarding the story of Dr. Frankenstein. This is a really cool rendition and I recommend this movie for ages 11 to 18 because it is intense and is a little scary at times. This movie leaves you on the edge of your seat rooting for Igor. Victor Frankenstein is in theaters now so go check it out! You are currently browsing the KIDS FIRST! News weblog archives for December, 2015.